The 4"x4" version of this design dates back to the 2004 or 2005. This smaller, 2"x2" version was added to the catalog in spring of 2012. The honey locust handmade tile design is also available in the 3"x3" size, which was created in 2015. 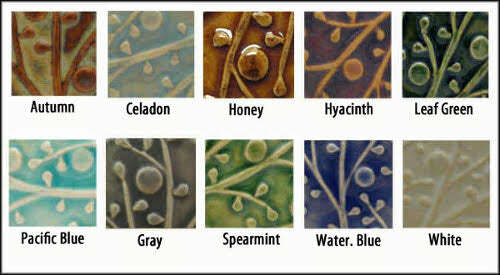 All glazes are non-toxic and lead free. Come with a slot on the back for easy wall hanging; also works great for permanent installation in a variety of settings. Arts and Crafts style 3-D relief design. Made from high fired stoneware for durability. The locust handmade tile is approximately one half inch thick at the edge, and slightly thicker where the raised leaf pattern appears.